Apple Watch officially hit the market this spring and we have the details you've been looking for. We know the watch will do amazing things like personalize your timekeeping experience, connect with friends, and look good for your gym selfies, but if you're wondering if Apple Watch should replace your Garmin or TomTom, read on to find out if it's a good fit for your fitness goals.Apple Watch will be available in three different styles: Stainless Steal, Sport, and an 18 karat gold edition. For our purposes, we recommend the Sport Edition because it's waterproof, comes in 5 great colors - blue, green, white, pink and black - and it's 30% lighter than the stainless steal models. So what about health & fitness? Like your current activity tracker, Apple Watch tracks the way you move throughout the day to help you keep moving. From your daily steps to breaking your PR, Apple Watch works well with all types of activity because of it's ability to track data. It measures total body movement, workout intensity, heart rate, calories burned and distance. Sounds great right? Not so fast. The GPS and wifi capabilities to track distance will only work when your Apple Watch is connected to your iPhone. And a Workout App? Yup. It shows real-time stats like elapsed time, distance, calories, pace, and speed for a variety of the most popular activities, including running, using the elliptical, and cycling. So how does it measure up? We LOVE the fact that Apple Watch has a heart rate sensor that doesn't require an additional strap to wear over your chest like some of the current products on the market. We're also excited about the the stylish bands and interface of Apple Watch. Although we haven't tested it, it looks very user friendly. So what don't we like? The fact that we still have to carry our phones on our runs and bike rides. Want to see the watch in action? 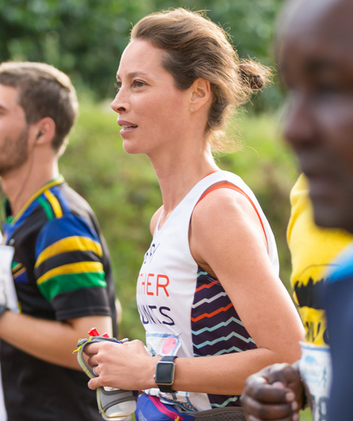 You'll have to wait until April 24th and be ready to cough up at least $350 but in the meantime, Apple has partnered with Christy Turlington Burns , founder of Every Mother Counts to share how she uses Apple Watch to stay fit. Click here to learn more. Will you be getting an Apple Watch or will you continue to use your current physical activity tracker?